A NEW YEAR, and Les Kiss will be desperately hoping for a new start for his Ulster side as they look to bounce back from the pre-Christmas thrashing at the hands of Connacht when Munster visit Kingspan Stadium later [KO 5.35pm, TG4, BBC NI]. The Ulster director of rugby finds himself under increasing pressure as his side continue to flounder their way through a mixed season which has seen encouraging and progressive performances offset by the same mistakes which have held the northern province back for several years. The back-to-back wins over Harlequins in the Champions Cup, results which re-ignited their European campaign heading into the final two rounds of the pool stages, were followed by the abject and embarrassing 44-16 defeat in Galway three days before Christmas. Described as the worst performance during his two-and-a-half years in charge, Kiss finds his position under considerable threat heading into the second of the three festive Pro14 inter-pro fixtures and both the Australian and his players have spoken this week about finding a response. “We have a week to make sure that we deal with that properly and Monday is the opportunity we have for that,” Kiss said during the week. Anything less than a win this teatime and the murmurings of discontent around Kingspan Stadium will grow louder as fans continue to be frustrated by a lack of consistency. The mood will be lifted considerably if Ulster can bounce back and produce a strong performance and Kiss is at least boosted by the return of Jean Deysel, Rodney Ah You and Kyle McCall as he makes 12 changes. John Cooney, Craig Gilroy and Louis Ludik are the only players to be retained as Rob Herring captains the side in Rory Best’s absence and out-half Christian Lealiifano is also recalled. For Munster, they are without a host of their internationals as Johann van Graan shuffles his pack after their recent surge in form was ended by Leinster’s raid of Thomond Park on St Stephen’s Day. Changes were always inevitable and Johann van Graan has made 11 in total with Conor Murray, CJ Stander and Peter O’Mahony all rested, although Keith Earls has shaken off the illness which kept him out of the Leinster game to start. “Ulster are very well set in Europe and in the table in the Pro14,” van Graan said. “They are a quality side. I can’t control what Ulster does, we’ve just got to reset ourselves. That squad depth will be tested. While Simon Zebo starts after coming off the bench last week, academy winger Calvin Nash will make his first start of the season while JJ Hanrahan and Duncan Williams form the half-back pairing. Winger Ronan O’Mahony is included in his first match-day squad this season following the fractured fibula he sustained last April while Jeremy Loughman, who is on a short-term contract from Leinster, is in line for his Munster debut after being named on the bench. 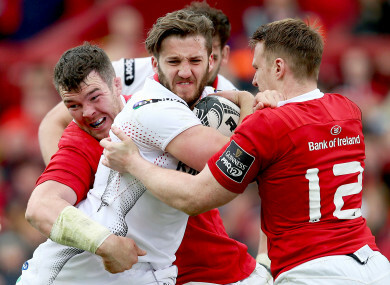 While Ulster can ill-afford to lose further ground on Scarlets and Leinster in Conference B, the same could be said about Munster who will want to atone for a poor showing last time out to keep pace with pacesetters Glasgow Warriors. The southern province have a good recent record in Belfast, too, having won on their last two visits to Ravenhill, although Ulster have lost just once at home in the Pro14 — to Leinster in round seven — since that defeat to Munster in October 2016. Both sides — depleted by the absence of key players — are desperate to start the year on the right note. It’ll come down to who wants it more. Email “Under-pressure Kiss needs big response from Ulster as much-changed Munster visit Belfast ”. Feedback on “Under-pressure Kiss needs big response from Ulster as much-changed Munster visit Belfast ”.